everyday objects in a whole new way. It began with these adorable skirts made from dishtowels over at Grace Violet. 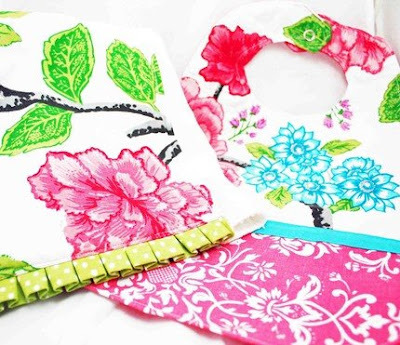 Then, Jen stepped it up a thousand notches with this crazy cute burp cloth and bib. She made them out of a TABLE RUNNER!!! Take a peek at her super fun shop full of bright girly yumminess. Janey, who spits up like a champion is putting these to good use. Hardly any work for a tiny bit of money. I bet you will never look at dish towels, table runners or placemats the same. I am sure this comes as no surprise, but I have that same placemat turned pillow sitting on my desk right now! I fell in love with it when the line came out and bought it, just to have, ya know? I never would have thought of creating something with it! You never cease to amaze me!! So cute! Just started following you. I love your things, You inspire me. I love to sew and appreciate how you use your creativity and gifts. I made one skirt already and have the towels to do another. I love how easy it is! Oh my gosh...that is gorgeous. I love that you think outside the box. What inspiration! Love it! Thanks! That is fabulous! I think I need to make a stop at target! You are correct, I will never look at these items in the same way, ever again! Thanks for so much inspiration - love the pillow! I love this! Think I will be making a trip to Target tomorrow! Okay, I'm at Target several times a week and I *never* see these things! I think I'm going to have to go (sans kids? fingers crossed!) and look for some of these fantastic things you are finding! Thanks for the inspiration! I bought the same set of towels at my Target. Just love them. ah i love it! i soo love your blog! makes me hold my babies a little tighter and a little longer (even though they get worme and try to escape) and makes me feel crafty!..i LOVE it. thank you. i was JUST at target and i didn't see those placemats nor would i ever have though of that idea! you are too cool miss julie!